A number of websites today offer exchange/trading services due to the demand for cryptocurrency. Do you have any idea on how much Bitcoin has risen over the last 5 months? It has risen at an outstanding rate that people now are hyped to get into the trading business of cryptocurrency. The hype has fueled the demand and is not showing any signs of slowing down. As of today, the exchange rate of BTC to USD is at $8200! That’s almost ten grand! A few months ago, it wasn’t like this. Imagine another few months and the BTC value will easily go over the $10k mark. What people are doing nowadays is that they either directly buy cryptocurrencies, or they look into trading through broker websites. We will be looking into one of these broker websites today, and the topic for this specific review is Deribit.com. The review would include their regulations, how to create an account, how to trade, and their website features, along with everything that we need to know about them. Without further delay, let’s talk about that! In getting to know a website, it would be best to read or know more about their regulations and restrictions as a whole. This is to ensure that you would not encounter any issues in the future while dealing with more important things to do, like trading. Compared to any other trading websites wherein fiat money is needed to trade, here at Deribit.com, they precisely do the opposite. Since all transactions are done using BTC, none of the trades are regulated unlike real money trades wherein websites would get registrations from different government bodies to operate. But don’t get upset, since the website is still being regulated by the Netherlands and they operate under their laws and restrictions. Their registered address is at Stationsstraat 2, 3851 NH, Ermelo in the Netherlands. More information about their Terms of Service can be read here. As we all know by now, trading cryptocurrencies have its own risk and advantages, reading through the Terms and Services will give you an idea of how everything is done on their end of the website. Since the website only accepts BTC transactions and does BTC trades, there are no restrictions when it comes to country of origin. This means that our friends from the United States that usually gets blocked out on various trading platforms, this website welcomes everyone that is interested in trading BTC’s. The creators of Deribit thought of a unique way of naming their new trading website. What they did is that they took the first letters of the word “Derivates” and “Bitcoin” to create their website name which is called “Deribit”. The CEO of the company John Jansen has been an active trader since the 90’s and was intrigued on how cryptocurrency would be the future, decided to create a trading platform dedicated to BTC trading in which we now know as Deribit. His main future goal is for his website to process 50,000 orders per second in the future. The website has been operating since 2016 and their physical office is in the Netherlands. Being active in the online trading world means that you have a clear idea of what would be the registration process of a trading website would be like. We have noticed that most of the trading websites today have different verification levels on where you need to comply with certain requirements just to level up your account to a higher tier. Leveling an account means that a trader (you) are able to increase the trading capabilities of the account that you are using. Usually, the restrictions would go around how much a certain account can trade/withdraw within a certain given period. Good thing that Deribit.com doesn’t have that restriction. This means that traders would not think twice about creating an account and going in all out against all odds and trade to their heart’s content. With that being said, how do we create an account with Deribit? First, a user needs to head on to their website Deribit.com and to provide the information needed. You need to have an active email, a username that you can use to log into your account, the password for your account and your all set! We strongly advise that you read their Terms and Conditions before creating an account with them. Once everything has been read, and ready to submit, just click on the tiny box provided below to confirm and click on Submit. A confirmation email will be sent to the provided one and just follow the instructions and you’re all done. You will then be redirected to their website and logged into your account. A logged in account will show you the trading dashboard right away. Don’t get confused with all the numbers and tabs that are in front of you, we will be discussing these features within the review. Since we’ve created an account with Deribit.com, it is time to put that to a test. 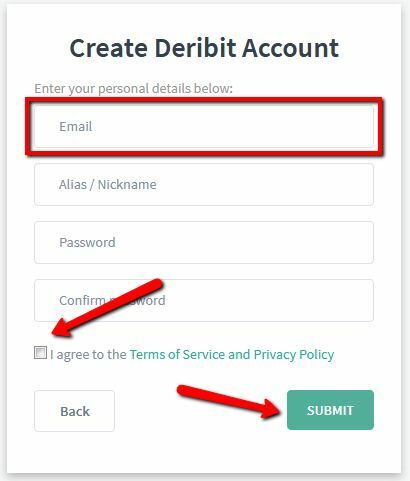 Please be advised that unlike some of the trading websites we have today, Deribit doesn’t have the luxury of having a dummy account/practice account that we are able to play with. This is probably one of their weak points as a trading website since people respond better to websites that have test accounts. 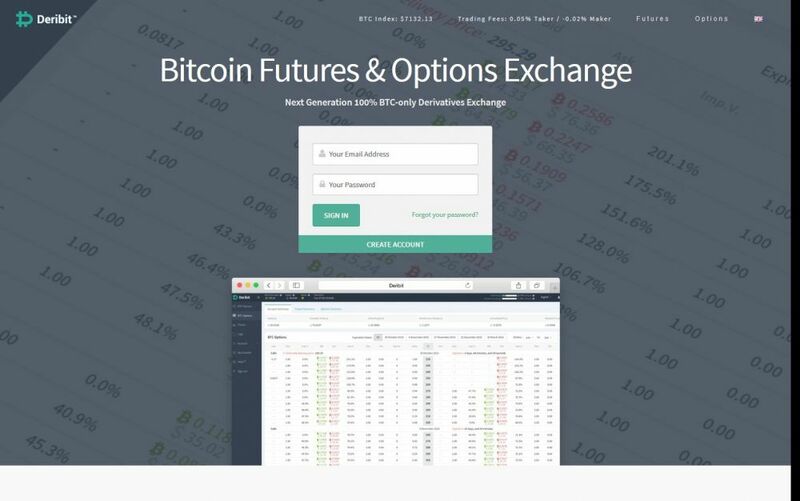 Here at Deribit.com, they have two main tabs; this would be the Futures tab and the Options tab. Both are different types of trading that we will be discussing in this review. First, we need to look into what the Futures tab has in store for us as this is the first tab that you will be seen without touching anything right after you have logged in for the first time. Please take a look at the provided screenshot above. This is your Futures tab and everything you see in this tab has something to do with Future contracts. The website Deribit sells future contracts for $10 each. The ability to choose between contract payments can be done on this page as well as seen in the screenshot on the left-hand side. Under the contract part of the order panel, you are able to choose the order type between Limit and Stop Limit. 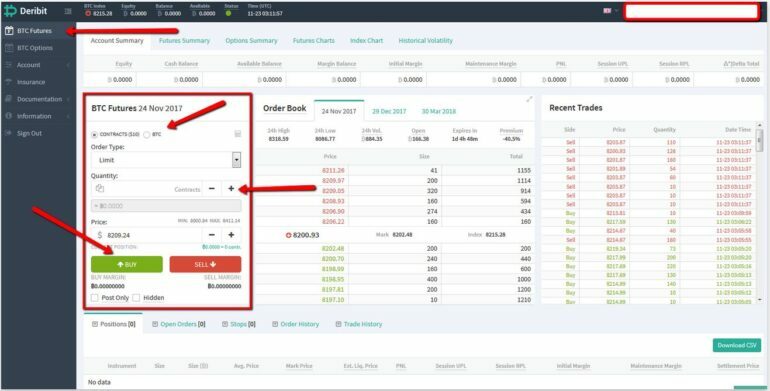 With the Stop Limit option, the user is able to change the Trigger and the Stop price depending on the Buy and Sell option a trader wants to do. This is to put a safety net for the trade that is going to happen. At the time this review has been written, the current price for BTC in Deribit.com is at $8209.24. Minimum is $8000.84 and the maximum is 8411.14. Please pay attention to these numbers as this is updated every few seconds, so keep a keen eye and look into this since decimal points are really important when it comes to making a profit in trading. Once everything has been reviewed, a user is now able to confirm the order by either clicking on BUY or SELL. A confirmed order will then appear on the bottom part of the page where all open orders and positions are listed. Aside from the order panel, we have the order book that shows the high and low trades for the day. Since we are looking at the Futures trading tab, we are able to see skipped dates with different tabs on the center part of the screen. Please be advised that this projected BTC prices greatly depend on what you have for that day. We advise you read more about trading with Future contracts to get a better idea of how the trade works. On the right-hand side of the trade screen, we’ve got the “Recent Trades” area wherein everything from purchased and sold trades is shown. These are trades that are happening on the website, this means that these are all the successful orders from differently registered traders. The recent trades tab also includes the timestamp on when that certain order was fulfilled. This may come in handy if you are trying to figure out the current buy and sell price that is actually happening at any moment. The second tab which can be seen in the screenshot above is the Options tab. This tab can be accessed through your Futures tab by clicking on BTC Options found on the upper left-hand side of the screen. Both of the mentioned tabs are only able to be accessed once an account is logged in, so make sure an account is logged in before looking for these tabs. Shown in the screenshot above is the order form BTC-24NOV17-5800-C. An order form can be acquired by clicking on any order being posted on the back of the order panel. Once the BTC Options page is opened, the panel you see in the screenshot is not yet visible. This can only be viewed the moment the trader decides to take the order being posted. Do not get confused with the BTC and USD selection for both Options and Futures trading because everything done in this website is in BTC, so the USD selection will be automatically converted into the current price of BTC. Another feature that registered users need to take note would be the Advanced Implied Volatility, which means that an order is continuously updated by the system, BTC prices may go up or down depending on the market. This can be seen on the provided screenshot above which is tagged as “IV*” The change will show every six seconds and the price of the BTC order will correspond to the given volatility shown on this box. Besides the order panel, we’ve got more information regarding the order book and recent trades shown for easy access. The location for the Order Book and Recent Trades tab is just positioned perfectly so that the trader would have a final look at the current BTC price. All websites have features. Having a feature makes a website unique from their competition. One of the most important things Deribit.com has for their registered users would be their Insurance. Aside from their regular features, this feature makes sure that all trades are taken care of and that the company itself is willing to put out money in case something goes wrong. Their Insurance balance of 25 BTC makes sure that their trades are insured and safe. Shown in the screenshot above, we’ve got a complete and transparent view of what’s happening with their insurance fund. It shows that they had an incident just recently on November 20, 2017, where they had one report of bankruptcy. The total insurance balance was not that dented, meaning it wasn’t that bad. Seen also in the graph, they had their balance go down at 23.17 BTC in early September this year. Having a transparent insurance feature gives traders that secured feeling when it comes to trading with their BTC’s. What are the other features that you found helpful on this website? Please do let us know in the comments section below. Now that we’re almost finished with our review of Deribit.com, it is time to talk about how to get your BTC’s in and out of the website. We will also talk about the fees that are imposed for all their trades. To get your BTC in, all a registered user needs to do is log into the account and click the Withdrawal tab found under the account name on the upper right-hand side of the account page. A deposit address is provided every time this tab is clicked. We strongly advise clicking on the “Get New Deposit Address” whenever a deposit is needed just to make sure that the address is not compromised. Shown in the screenshot, we can see that a QR code can also be used to scan automatically if your BTC wallet allows it. The website does not charge any deposit fee but they strongly suggest not depositing less than 0.001 BTC as this would create errors and may not be processed. When it comes to withdrawals, the process is almost the same. Head on to your account and select Withdrawal and you will be redirected to the withdrawal page. 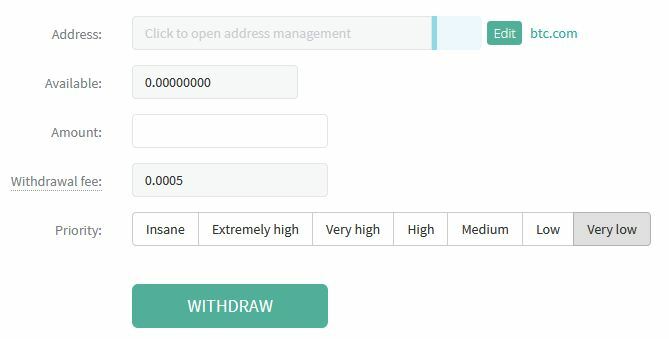 Provide your BTC wallet address, enter the desired amount to be withdrawn and the fee will be calculated. Please be advised that the priority level would depend on the fee you are willing to pay. The higher the priority, the larger the withdrawal fee will be. The fee ranges from 0.0070 for Insane and 0.0005 for Very Low priority. Fees are also important to look at if you want to trade through online websites. Different websites charge their traders in different methods. Some do not have trading fees as their BTC rates are already adjusted so that they will be able to make enough money by it. We personally like websites that have trading fees as this can be seen and calculated properly, unlike hidden fees that go with their BTC value. For Futures trading, the regular contract price is $10. Maker fee is still at -0.02% and the Taker Fee is still at 0.05% since we last wrote a review about the website. The only difference would be their Options fees. Both Maker fees have been adjusted recently from being free to 0.0004 BTC per transaction. Now the options fees are both 0.0004 for makers and takers. Any updates about fees can be read here. People always measure websites through their services and features in general. But they often forget that the most important part of a trading website should and always be their ability to assist you whenever you need them. Great customer service cannot be presented over night due to the expertise needed to provide such service. But a good website should and always have proper channels for great customer service to flourish. A good sign of a website that is well presented when it comes to providing customer service would be websites that have complete channels from email, chat, up to phone support services waiting to help their customers in any way possible. Aside from all the mentioned channels above, they do have a Twitter account in which people are able to Tweet about issues and read the latest updates. Though the website seriously needs to have a phone support, they do have a list of emails provided below for specific channels that you want to reach. Deribit also has a live chat feature that registered users are able to access anytime through the Chatbox located on the lower right corner of the logged in screen. Deribit.com, in general, is not a bad website. They have the features needed for a trader to make a successful and comfortable trade. The website is not friendly to newcomers since the page itself is not designed for them but easy for traders that have been around online trading platforms. 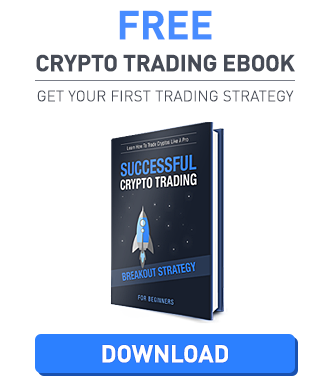 The website is focused on BTC trades, and it is not that hard to create an account. Fees are reasonable and they have insurance for all the trades happening on the website. They do need to work in letting in FIAT payments so that people can access their website easier in terms of trading. Also, they need to add a phone support for better customer service results. All-in-all, the website is not bad and we give it solid 4/5 stars!